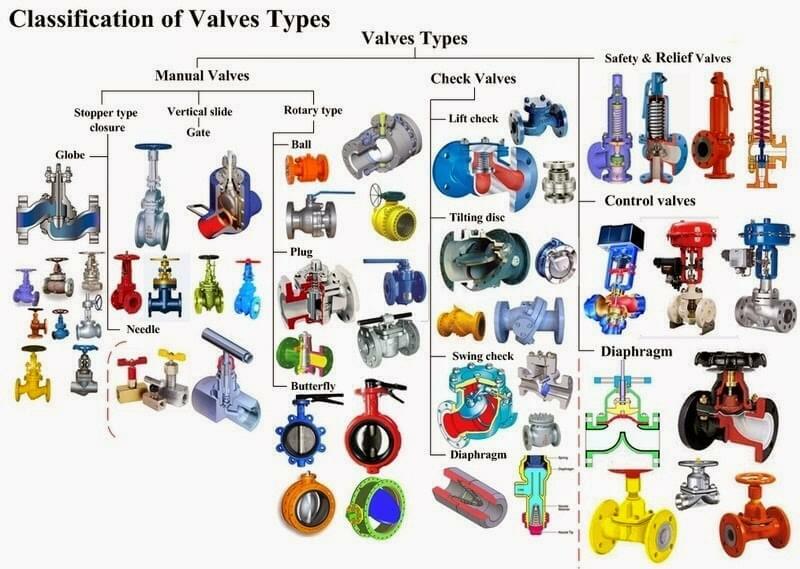 In industries, we use many types of valves based on application and they are Manual valves, Check valves and Safety valves, Relief valves. Gate valve should ideally be used as on-off valve. It is not advisable to use them as throttling valves because in partly open conditions, erosion of gate might take place. In partially open conditions, due to vibrations, valve is exposed to quick wear and tear. Also, during closing and opennig, there is considerable amount of friction and hence, opening and closing these vales quickly and frequently is not possible. Similar to ball valves, plug valves are also quarter turn type of valves. This valve consists of a plug which can be either cylindrical or conical in shape. The plug has a through slit which remains in-line with the flow in the open condition. When the plug is turned by 90 Deg., this slit becomes perpendicular to flow and the valve gets closed. In the open condition there is minimum obstruction to the fluid flow through the valve as the flow passes around the disc aerodynamically. This results in very less pressure drop through the valve. Due to its unique mode of operation, the valve can be actuated easily without requiring high torques and wear and tear. Due to lack of friction, use of bulky actuators can be avoided. Another advantage offered by butterfly valve is their compact size. The valve is quite compact, resembling a metal disc. This makes their installation very easy. They can be used to handle slurries and fluids with suspended solids as there are no cavities for deposition of solid particles inside the valve body. Globe valve is a linear motion type of valves and is typically used in both on-off and throttling applications. In globe valves, the flow of the fluid through valve follows an S-path. Due to this, the flow direction changes twice which results in higher pressure drops. Due to other advantages offered by them, they are widely used in applications where pressure drop through the valve is not a controlling factor. Pinch valves offer many benefits over the other types of valves. They can be used for handling corrosive fluids as there is no contact between the fluid carried and the actual valve mechanism. Once suitable sleeve material is selected, this valve can work with a variety of fluids. As fluid being carried does not come in contact with the metal parts, these valves can be used for food grade applications also. Lift check valves work simply on the principle of gravity. When the fluid comes in the forward direction, the disc gets lifted from the seat against the gravitational force by the force of incoming fluid. The valve thus allows fluid to pass in this direction. When the fluid comes in opposite direction, it supports the force of gravity and the disc remains on the seat, keeping the valve closed. In this kind of check valve, the disc or the closing element swings around a point to which it is hinged. When the fluid comes in the forward direction, the disc swings in an open position allowing the fluid to pass. When the fluid flow comes in the opposite direction, the disc swings and rests on the seat to lose it. In this kind of check valves, tight shut-off it provided using a spring. The spring holds back the disc on the seat. Even in the forward flow condition, the fluid should exert some pressure, called cracking pressure in order to open the disc against the spring pressure. This kind of check valves uses diaphragms arranged in such a way that that open to allow the flow only in forward direction. When flow comes from the reverse direction, the diaphragms remain closed. Steam traps are passive device and work on the principle of the pressure difference. During operation, process pressure might go under the back pressure after trap. In such situations, because of the negative pressure across trap, condensate might go back into the process equipment through the trap. Applications where two or more fluid are mixed, check valves should be installed at the end of each individual line. This avoids the contamination of one fluid by the other. Disc check valves, when fitted in a reverse way, can act as vacuum breakers. While being used as vacuum breakers. May Instrument tools Provide The Programming for DCS? Will See in future. Programming may change from system to system. so if started i have to cover all !! !